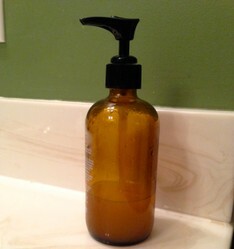 Easy natural homemade Apple Cider Vinegar and Tea Tree oil facial toner. OK so when I started out on my journey of a chemical free life I started small. I don't know why I decided to start out with facial toner. When I try to think back the only reason I may have tried it was because it was only three ingredients and I had all of them on hand. :) I recently came across a bottle of expensive toner I had asked for for Christmas and decided I didn't want to be wasteful and took a break from my homemade toner to finish off the rest of my expensive natural organic toner and....well... the results were not good. I ended up breaking out and my face lost that awesome glow that I was use to when I used my homemade toner. So needless to say I will NEVER go back to using anything else. The recipe I use is super simple and easy to make and you can customize it to fit your skin sensitivity. And just incase you are wondering... NO you will NOT smell like vinegar all day. The smell will go away after about 30 min. And if you put facial lotion on after the toner then it will definitely take away the smell. All you need is Organic Apple Cider Vinegar (ACV), Tea Tree Essential oil and filtered or distilled water. I like to use Bragg Apple Cider Vinegar Organic Raw because it has "the mother", which has all the awesome goodness in it. I also try to get my Essential oils from a reliable source and one that won't break the bank. NOW Foods has a line that I can get at my local Whole Foods. In my recipe I say to use filtered or distilled water, sometimes straight tap water (either from a well or from the city) can have "impurities" in it. What I mean by that is city water is, in a way, is processed. If you think about it you flush the toilet down it goes; it travels to the waste management plant and gets cleaned, filtered and then has chemicals added to it to make it drinkable again, fluoride, chlorine, etc.. Some well water can contain higher than normal amounts of minerals and can be harsh on your skin, hair, clothing and appliances. I have a well and I run my tap water through my Britta filter and I feel that works well for me. I will let you know that Tea Tree Essential oil can be toxic if ingested so do not get any in your eyes or mouth. Just like you would not want to ingest any other beauty product you use. When you apply the toner you can have a tingling sensation but it will not last long. I like to imagine that it is killing all the unwanted zits and blackheads and any bacteria that is on my face, so now I kind of enjoy the tingling sensation. Also ACV can be harsh on sensitive skin, and I always suggest starting with a lower amount of ACV and then working your way up if you feel the 1 tbsp is just not cutting it. This is the recipe that I use and I use 3 tbsp of ACV and the 15 drops of Tea Tree essential oil. Both ACV and Tea Tree essential oil have amazing health benefits that I will talk about on a later post, but until then I encourage you to try this recipe out and let me know how it works for you! Hello katiem2! Thank you so much for stopping by my page. Hopefully I will be writing a whole lot more on the subject so keep a look out! Monoi and Tamanu oil may seem too exotic for everyday use, but they have wonderful properties that will make you want to use them on a daily basis.